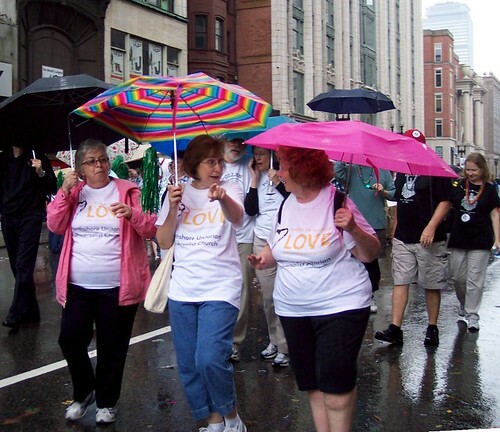 Church members (from left) Rosemary Broadbent, the Reverend Frieda Gillespie, and Lois Markham make their way through the soggy city streets during the Boston Pride Parade on Saturday, June 12. Boston Pride has celebrated and marked the struggle for lesbian, gay, bisexual, and transgender civil rights for the past 40 years. NSUU is a Welcoming Congregation for LGBT families and individuals. This entry was posted in social action. Bookmark the permalink.